The Industrial Engineering Department supports a wide range of research projects in HSE (Human Factors, Safety and Ergonomics), Data Mining, Port Management, Operations Research, Supply Chain Management and process improvement. The department receives research funding from government, industry and internal sources. Doctoral, masters and undergraduate can participate in research. 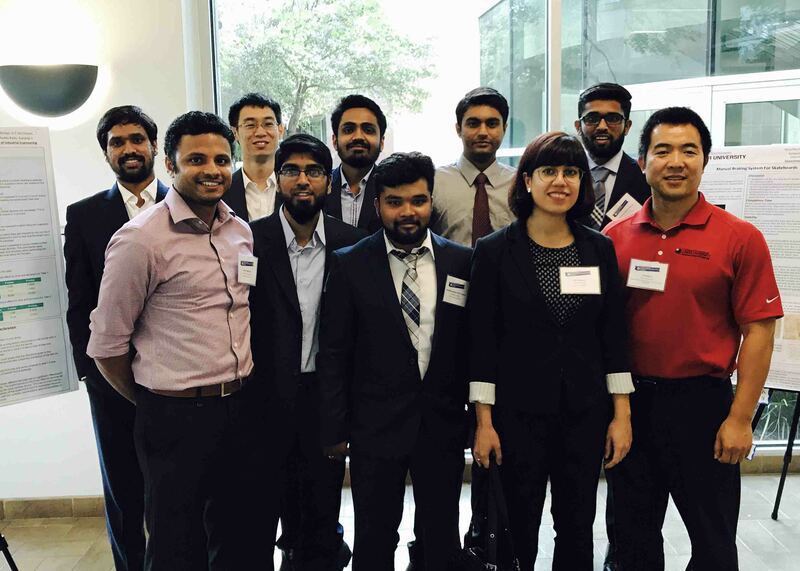 Undergraduate engineering students have senior design projects that are sponsored by companies. Past projects have selected equipment for manufacturing plants, improved business processes, collected and analyzed data, optimized inventory levels, and improved plant layouts. Companies can participate in senior design free of charge. Please contact Dr. Craig (brian.craig@lamar.edu) for more information about senior design and other research capabilities. The Mariner Safety Research Initiative (MSRI) is a product of the collaborative effort between American Bureau of Shipping (ABS), Lamar University, and International Industry Partners. The MSRI includes a large international database of more than 100,000 maritime injury and close call (near miss) reports from over 31 data sources. Dr. Craig (PI), Dr. Curry (CO-PI), and Dr. Zhu (CO-PI) have worked on this project since 2010. The incident databases have enabled us to create the MSRI, a public forum to share safety related materials and resources with not only industry partners, but the maritime industry as a whole. The incident data has been analyzed to identify trends, possible causes and lessons learned and develop safety related guidance materials including benchmarking statistics and relevant training tools. The overall goal of the MSRI is to improve mariner safety through sharing these data findings and providing safety related documents in a useable context. The MSRI is broken up into two parts: the Public Site and the Industry Partner Site. The public site includes a general “sampling” of the documents and information that is available to the MSRI Industry Partners. For more information about this project, please see http://maritime.lamar.edu/. This Research Experiences for Teachers (RET) in Engineering and Computer Science Site, entitled, Incorporating Engineering Design and Manufacturing into High School Curriculum, at Lamar University (LU) Beaumont, will provide opportunities for STEM high school teachers from underserved school districts in Southeast Texas to engage in cutting-edge advanced engineering design and manufacturing research and develop curriculum modules based on their research. Advanced design and manufacturing is an industry with growing opportunities for creating the next generation workforce. The force and velocity of waves especially those produced by passing ships was measured at two strategic locations in the Sabine Neches Water Way. We measured flow velocity and wave characteristics including wave height, speed and orientation. Data analysis included wave height and wave energy especially those produced by passing ships. We obtained ship data from the USCG and correlated ship size, speed, and other parameters to wave impacts on the river bank and subsequent erosion. Erosion is a problem for two reasons. It causes loss of land but more important to our sponsor the Sabine Neches Navigation District the much of the material that results from river bank erosion ends up in the deep draft ship navigation channel thus reducing the depth of the channel. This material must then be dredges out of the Navigation channel and deposited elsewhere. It is usually deposited in placement areas. This is an expensive process. Phase II will be devoted to evaluating and recommending wave attenuation remedies that will result in less erosion and subsequent need to dredge the material from the navigation channel. Design and evaluation of engineering systems to reduce erosion caused by ship generated and other waves will be accomplished in Phase II of this project. Dr. Berna Eren Tokgoz's project examines the highly chaotic environment during an evacuation. There may not be any pilots assigned to the ships and the risk of collisions or other accidents may get higher in these situations. The substances that are transported in a ship have various hazardous impacts during an evacuation process from the port. This study focuses on: 1) establishing operational concept of UAS for effective port / terminal operations; 2) developing mathematical optimization model(s) to ensure coordinated optimal operations of vessels and UAVs; 3) developing a distributed control algorithms for UAV swarms; and 4) conducting risk analysis and resiliency study in UAV-aided port operations. The purpose of this study is to lay the foundation for the development of future port system using unmanned aerial system (UAS). This study is composed of three detailed sub-topics. First, we study how to establish operational concept of UAS for effective port / terminal operations. Particularly, the focus of the research is on ensuring optimal routes generation of chemical tankers which are performing their respective loading / unloading operations. To optimize the problem, current chemical tankers operations in Houston ship channel are studied, and mathematical optimization model(s) are developing to ensure optimal operations of chemical tankers. Second, we develop a mathematical model(s) to implement the concept of distributed control of multiple UAVs. This research focuses on decentralized control of UAVs in port operations based on game theory. Third, We conduct risk analysis and resiliency study on various safety & security problems that may arise when UAS is introduced in port operations. This project was funded by the Center for Advances in Port Management (CAPM) at Lamar University. A methodology will be presented for a temporary closure scheduling of the Houston Ship Channel in order to construct a new bridge over the channel. A poor closure scheduling can cause a substantial loss in revenue for both port authorities and vessels. In this study, we will first analyze historical data for a good estimation of vessels’ traffic and shipping inside the channel, next we will develop a model in ARENA software to simulate the traffic and queue in the ship channel, under different closure scenarios. Constraints will be considered for the working rules of the channel such as daylight restrictions and combined beam rules. Finally, simulation results will be presented for number of the ships affected and also for the total ship time lost as a result of closures, and accordingly, the optimal channel closure schedule will be determined. Besides, policies would be recommended to the port authorities to substitute the current first come, first serve policy. Please see Dr. Hamidi webpage for more information about her port research effort. Rahimi, B. *, Abtahi, A., Hamidi, M., Cho, J. & Stromberg, E. “Optimal ship channel closure scheduling for a bridge construction”. In: Proceedings of Institute of Industrial Engineers Annual Conference, May 2017. Accepted.